Just about everyone thinks their dog is the best dog in the whole world. I won’t try to talk them out of that belief; it’s just that they did not have the blessing of knowing our dog, Cochise. Cochise’s story is the story of our family for 15½ years. Not in the sense of the misadventures of Marley and Me. Cochise never had adventures that caused trouble, except perhaps her efforts at befriending skunks. No, Cochise was there to greet new grandchildren, participate in Christmas and birthdays, and visit with the guests at graduation, engagement and first communion parties. She was there for all the highlights and she was there for just the regular days, and she made the regular days special. Thankfully, we got all of that on footage thanks to our Best Cameras For Pets. We almost sent some videos to television shows but decided to keep our dogs life private, even though we are convinced that we had chances to win with these great shots we got. In late 1993, my wife and I agreed that it would be great to have a dog and started search for Superdog Dog Training Sacramento. Now Elaine is not one that makes decisions lightly, and she researches things a great deal. Once we decided to get a dog, she read everything she could about different breeds and the qualities they possessed. Well, that and other descriptions of the breed’s gentle disposition sent Elaine on a search to find such an animal. 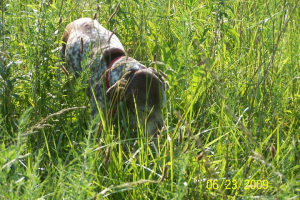 Not long after she decided the German shorthaired pointer was the breed for us, a local newspaper ad indicated a litter of shorthair pups that was located just a few miles from our home. They were born on February 13, 1994, the day before Valentine’s Day. Elaine called and made an appointment to see the pups. There were seven. When we went to see them they were all cuddled up with their mother. We neared the new family and both crouched down to get a better look, yet trying not to disturb the group. The puppy who was to become Cochise looked up from the crowd and saw us. While the other pups also seemed to look, they stayed with their family group. This puppy got up and came to visit us. It was mutual love at first sight. We are fond of saying that we did not choose Cochise, but rather she chose us. We eventually approached and interacted with the other pups, but there really was no need, the puppy that had come to us had already won our hearts. She stayed with her birth family until early April, and received top notch care from the couple in whose home she was born. When she did come home they presented us with a stuffed dog bone that has pictures of Cochise’s mother and father on each end and inscribed with her birthday. She came from a loving home. In April of 1994, my mother and father were living with us. They had sold their home and their new home was not yet ready. This was to be a recurring family happening through the years. We were blessed to be able to open our home to family members in transition over the years. They were blessed because they got to know and love Cochise. There is controversy over how Cochise was named, but it took nearly six weeks to come up with something proper. Her liver and white spotted coat was reminiscent of an Indian pinto pony. She did, even as a puppy, have a sense of nobility and aristocracy about her. Naming her after the great Apache leader now seems the only thing that could have happened. She was a hunter with a gentle soul. We have a large backyard that backs up to an electrical power line right of way, on the other side of which is a golf course. My Dad was an avid golfer and good one too. He shot 72 when he was 72. Even when not golfing, he loved all things golf. Many golf balls went astray in the field behind our home, and Dad and Cochise would take long walks in that field. Somehow she sensed that golf balls were a thing of value to him. She was still a very young puppy, with no training whatever, but she would track down golf balls in the brush and the bushes and bring them to Dad. Eventually, there was a large plastic bag full of golf balls in the garage. Over the years Cochise’s ability to sense a need demonstrated itself again and again. Cochise was always friendly with other people and animals. 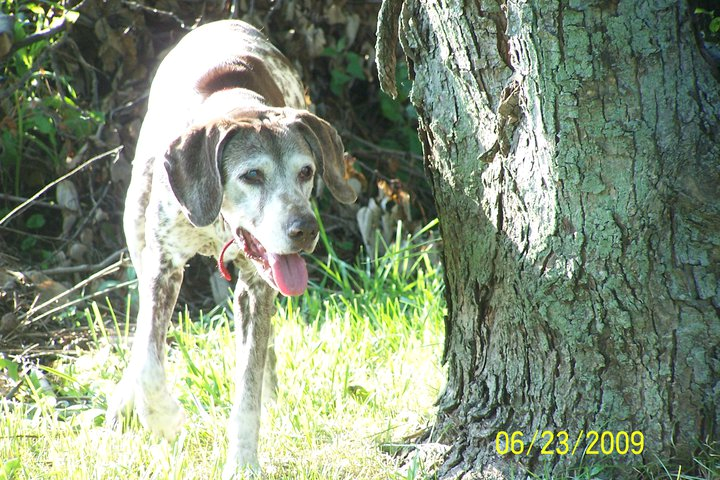 She had her pointer instincts that would lead her to trees occupied by birds and squirrels, but she did not chase other animals, she approached them. When she looked up in a tree, she had a plaintive look, inviting the object of her interest to come down and visit. This affinity for friendship most likely caused the only misadventures she had. The large field behind the house is home to a variety of wildlife. Cochise wanted to befriend all creatures. She would peer into the homes of groundhogs, squirrels and snakes. She would sometimes paw at these holes, sort of like knocking on the door. She never dug furiously, but rather gently scraped at the ground. While no one ever saw her encounter a skunk, we were always aware of the aftermath. It would usually be in the springtime when the skunks were nesting. She would come home with an unmistakable aroma. As this happened in the spring one can imagine Cochise pawing gently at the nest, inquiring if she could visit the new born skunks. She meant no harm, but the momma skunk no doubt did not see it that way. Cochise did not enjoy her tomato juice bath that followed these encounters, but submitted with her usual equanimity. It seemed she thought the bath a small price for trying to make new friends. Cochise had the speed and grace of an athlete as the Kennel Club describes. She took great joy in retrieving balls and catching flying Frisbees. As someone prepared to throw she would gauge the direction of the arm swing and take off before the ball or Frisbee was released. It seemed impossible to out throw her speed and anticipation. There were times when she would make a spectacular over the shoulder catch much like Willie Mays in the 1954 World Series. We began using tennis rackets to make the endeavor a challenge for her. The racket would send the ball beyond her and into the bushes and field. 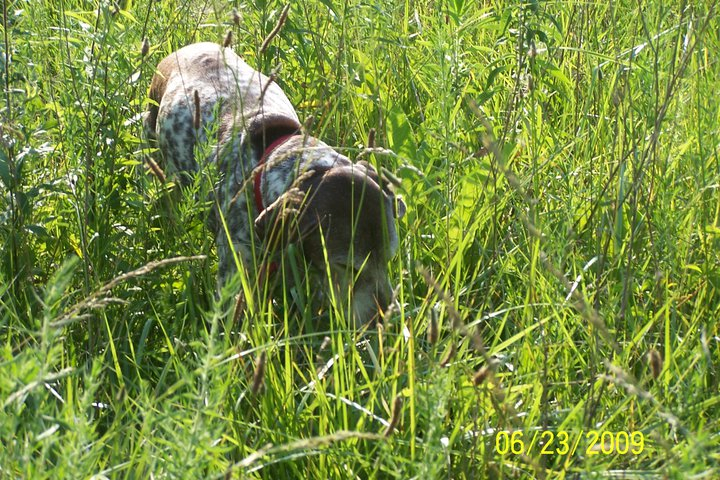 She would watch the flight and hunt through the brush however long it took to return with the ball. It seemed impossible to challenge her ability with Frisbees as well. Our son Matt had taken up Frisbee golf, and had special disks that could travel great distances. With Matt’s skill and these special disks, he could out throw Cochise’s speed, but she still would track the disk down wherever it had flown. Those are “dog” things that provided joy and companionship, but they are not the essence of Cochise. Her essence was revealed in how she related to the grandchildren as they came into our lives. Over the years, families have transitions. Ours had as many as most, and as our children found themselves changing jobs, moving to new homes or renovating a current home we opened our home to them. They came and stayed, along with their young and in some cases new born children. These times were a blessing for so many reasons, particularly the chance to bond with the grandchildren in a very special way. People track a child’s language skills and try to remember the first recognizable words they hear from a child. My personal memory of the first word I could understand from our youngest grandson, Wyatt, was “chise”, talking about our dog. Many dogs are territorial and treat children with disdain as if intruders upon the dog’s space or as competitors for attention. This was not Cochise. For a variety of reasons, the first four (there’s now five) of our grandchildren spent many of their earliest days living in our home. Far from treating the children as intruders, Cochise welcomed the new family members, and seemed happy to have buddies her size. She was gentle, inviting them to play. Cochise was never troubled when they climbed on her back or tugged her ears. It became a tradition to blow up a large blue mattress, known as the big blue bed, for the children to watch television and eat popcorn. Cochise loved these times, since she early on acquiesced to not getting on couches or beds, though she had the ability to do so. When the big blue bed was on the floor, she could get on it and curl up with her family, and enjoy popcorn and a movie. We often believed that Cochise understood English. She had no special training in any sense; she was just around the family she loved. She loved McDonald’s sausage biscuits and would wait at the garage door whenever she heard someone say McDonald’s. If a ball and Frisbee were laying in the yard, and you asked her to find one or the other, in no special tone, she would return with the one you had asked for. Matt is fond of telling a story. Cochise was near him and making a request of some type. Matt said to her, “If you don’t stop, I am going to step on your foot”. In response to that Cochise lifted her paw up and out of potential harm’s way. We talked to her as if she understood, but she understood more than words. She understood actions and feelings. She would see suitcases being packed and would stay especially close at those times, not wanting to be left behind. When tears came in life as they inevitably do, she would stay nearest to whoever was hurting. You could talk with her about life, have an attentive ear, and feel as if she had answers. Elaine is fond of saying that when you looked into Cochise’s eyes you could see she had a wisdom about the world. The peace about her was contagious, and could help you achieve peace during troubled times. During her last few years, as family members became established in their own homes and lives, Cochise did not always have the company she thrived upon. To her great benefit, our son’s dog, Digger came to stay with us. Despite differing breeds and personalities, they became the best of pals. Digger was six months older than Cochise, a Staffordshire bull terrier, sort of a mini pit bull. Though Digger was a little on the small side – she fit the Jen Review of her breed: sturdy, courageous, intelligent and loved to play. She was a good dog, and a great companion for Cochise. They slept together, ate together and went out together. It was interesting to watch that relationship grow. Cochise was a hunter and retriever by nature, as Elaine likes to say, a working dog. Digger was not quite so full of energy, and had little interest in bringing back a ball, stick or Frisbee. Digger had powerful jaws and would just as soon chew up a Frisbee as bring it back to you. Digger had grown up with Matt while he was in college and maintained the mentality of a college student. If she had been able, Digger would have wiled away her days playing video games. Digger and Cochise began to teach each other things. Digger saw how Cochise took such great joy in chasing and returning balls. Digger began to chase them as well, and even began to bring them back, though never with the same fervor as Cochise. Since Cochise was much faster than Digger, if a single ball was thrown, Digger would make a halfhearted effort to go after the ball knowing she had no chance. It would be a competition she would never win, so why play. To have Digger participate, it became necessary to throw one ball long and far, and after Cochise had taken off, throw another ball short and soft. Digger would get the second ball, and return about the same time as the much faster Cochise. Cochise loved to spend hours outdoors and frequently did so, checking everything her curiosity led her to check. Digger was less curious and would return much sooner. A deck outside the master bed room has a sliding screen door. Before Digger’s arrival to live with us, when Cochise wished to come back in the house, she would sit by the deck’s screen door patiently waiting for someone to open the door. Digger had no such patience. Digger figured out how to slide open the screen door with her nose. The first few times were a mystery. No one had opened the door, yet Digger was in. Questions arose as to who left the screen open for insects. Digger had not closed the door behind her. Eventually we saw Digger slide the door open. Later we saw her open the door for herself and Cochise. If Cochise arrived on the deck first she would wait until Digger opened the door for both. Over time Cochise watched Digger do this enough and figured it out for herself. Cochise was probably 11 or 12 at the time. Perhaps people can’t teach old dog new tricks, but certainly her best pal can. Digger was six months older than Cochise. Digger’s age caught up with her first. Cochise lost her pal. For the rest of Cochise’s days from time to time you could tell she was looking for Digger, and missed her greatly. Around Thanksgiving 2008, Cochise began to eat less and sleep more. Her eyesight and hearing were failing. She had developed arthritis. We gave her Motrin with peanut butter and Elaine went to great lengths to prepare her special meals of ground beef and rice. She seemed to perk up. I looked forward to the spring time, hoping good weather would improve her health and spirit, primarily her health. Over the next few months she had trouble getting comfortable and sleeping through the night. Though she understood so much, she had a hard time expressing her pain. Rather than nice warm weather, we experienced a cold, wet spring. I can only imagine the problems for Cochise’s arthritis. Though spring 2009 was cold and wet, Cochise would still want to go out, investigate the world and be true to herself. She still wanted to return balls and Frisbees, though the increasing difficulties were evident. The nature of the ball game changed. She would stay close before the ball was thrown. Cochise would see the arm swing and try to anticipate the throw, but her eyes could not follow the flight. That did not stop her from tracking the ball. Though she had not seen the flight, she knew the ball had to be reasonably close. She would search the yard in a grid pattern, criss crossing in a deliberate fashion until she tracked down the ball. She had not seen it originally, but compensated for her failing senses. She would run, but it was a light jog due to her arthritis. From 1994 to 2009, the family had grown into their own homes, and Digger had passed. Cochise was alone often. I took her to work with me when I could. She would gamely get into the car and stick close when I was in the office. Her desire to be with family or to meet new people never diminished. On June 23, 2009, it became evident that there was an obligation to treat her with the dignity and respect that she had shown to us all during her life. Cochise and I shared a cheeseburger and went to visit my parents. She recognized the people that had shared her earliest days and exhibited the love and kindness that were her hallmarks. It was a very warm sunny day. The kind I had hoped for in the fall. Cochise and I went for a walk in the field by the golf course behind our house that she loved so much. She jogged slightly ahead of me, but always turned around to see where I was at. While we walked her breathing became labored and her tongue was out. She could not tolerate the heat. We finished that walk and went into the air conditioning and had some sherbet. She was rarely on a leash. Arriving at the vet’s I put a leash on her, and she reacted little. She never enjoyed going to the vet, and always knew the location when we got there, usually straining at the leash. This time she did not. She simply got out of the car, and walked in with me. It seemed as though she was ready. Inside, the arrangements were made. Cochise got on the scale and weighed 40.9 pounds. The price for the vet’s services and the private cremation was higher at 41 pounds. It seemed as though Cochise was thoughtful to the end. Cochise and I went into the room where she had been examined so many times before. She knew the room, but did not exhibit the usual distress at being there. The doctor asked if I wanted to stay. I said I could not leave her now. I sat on the floor and held her in my arms. The doctor gave her an injection in her right hind leg. Cochise relaxed on my lap, but her breathing began to sound congested. The doctor returned with a stethoscope, and indicated there was still a heartbeat. A second injection was given and Cochise’s breathing smoothed out. A third injection was given in her right front leg, and soon there was no heartbeat. The vet staff left us alone. I sat on the floor with her for a while, thanking her for being with us and for all the joy she brought. I got up and gently laid her on the steel table where she had been examined so many times. I opened her right eye and looked inside. Her eyes seemed to still have the wisdom that Elaine often talked about. I kissed her ear and said good bye. The next morning I went to pick up Mom and granddaughter Allison for an airplane flight to meet up with Elaine. There with Allison was our daughter Donna and granddaughter Isabelle. Isabelle was waiting for me at the end of the driveway. I got out of the car and said nothing, but Isabelle ran to me, jumped up and hugged me with all her might. She and I started to cry and it seemed as though we should never let go. The same followed with Allison and Donna, and Mom and Dad. Allison and I tightly held hands for a long time on the airplane. The same scene took place with Elaine that evening. We all loved Cochise as she had loved us. The day following I was in a continuing legal education class, that fortunately was about dealing with stress. The presenter quoted a poem from the 13th century that I took comfort in. It was written in 1230 by Mewlana Jalaluddin Rumi. It is entitled the Guest House. I believe that Cochise was sent as a guide from beyond.